SMD-7500 Bandit Split Vision Rework | Welcome to A.P.E. The Bandit is a low cost, Manual Split Vision Placement Rework System.Ê Built on a completely self-contained platform, no factory air, the Bandit is capable of reworking boards from 1″ to 32″ with SMT pitch as fine as .003″. 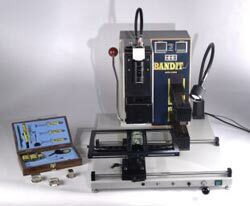 Complete with motorized Z-axis on the Reflow head and single push button controller operation, the Bandit is priced to move. The Bandit is equipped with APE’s newest 4-mode controller, from manual foot pedal operation to automated ramp/soak. One of the unique features of the Bandit is its “Slot Machine” style handle, which is used to engage the placement cylinder. The Bandits X, Y, Z and Theta Axis’s are configured in a manual configuration for fast placement of larger pitch IC’s. OverviewAPE is please to announce the arrival of its newest product, the “Bandit”. 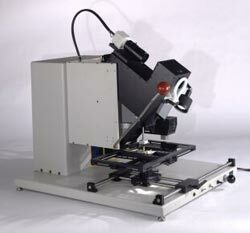 The Bandit is a low cost, Manual Split Vision Placement Rework System. Built on a completely self-contained platform, no factory air, the Bandit is capable of reworking boards from 8″ to 12″ with SMT pitch as fine as 5mil. 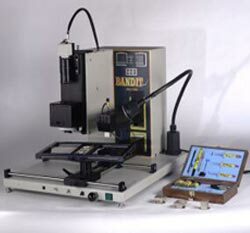 Complete with motorized Z-axis on the Reflow head and single push button controller operation, the Bandit is priced to move. The Bandit is equipped with APE’s newest 4-mode controller, from manual foot pedal operation to automated ramp/soak. One of the unique features of the Bandit is its “Slot Machine” style handle, which is used to engage the placement cylinder. The Bandits X, Y, Z and Theta Axis’s are configured in a manual configuration for fast placement of larger pitch IC’s. 7500-1000 Bandit 110v Vision PlacerUnit Includes: Power Supply 110v, Reflow Head with 2.500″ of Z-Axis travel (1200watts), Digital Controller with all 4 modes of operation, Sniper Vision Placement System in manual configuration, 13″ Color Display, 8″ x 12″ Frame Holder on linear rails, Self-Contained Vacuum IC removal device, SMD Tool Kit, Halogen Light w/ mounting bracket, Chipmaster™ and Sniper Demonstration video, Foot Pedal, Power Cord, and three (3) user-selected Reflow nozzles.7500-1502 Bandit 220v Vision w/ Placer Pre-Heat Unit Includes: Power Supply 220v, Reflow Head with 2.500″ of Z-Axis travel (1200watts), Integrated Localized Pre-Heat System (1200watts), Digital Controller with all 4 modes of operation, Sniper Vision Placement System in manual configuration, 13″ Color Display, 8″ x 12″ Frame Holder on linear rails, Self-Contained Vacuum IC removal device, SMD Tool Kit, Halogen Light w/ mounting bracket, Chipmaster™ and Sniper Demonstration video, Foot Pedal, Power Cord, and three (3) user-selected Reflow nozzles. APE also offers video narrated trials to help in the evaluation process, our lab technicians will perform your job and return the completed work with the video. 7500-1500 Bandit 110v Vision w/ Placer Pre-HeatUnit Includes: Power Supply 110v, Reflow Head with 2.500″ of Z-Axis travel (1200watts), Integrated Localized Pre-Heat System (600watts), Digital Controller with all 4 modes of operation, Sniper Vision Placement System in manual configuration, 13″ Color Display, 8″ x 12″ Frame Holder on linear rails, Self-Contained Vacuum IC removal device, SMD Tool Kit, Halogen Light w/ mounting bracket, Chipmaster™ and Sniper Demonstration video, Foot Pedal, Power Cord, and three (3) user-selected Reflow nozzles.